Wednesday is actually St Bartholomew’s Day and it also marks the 18th Anniversary of Eira and me being ordained as Anglican Ministers – and that after being ministers in Churches of Christ for 17 years. So St Bartholomew is a somewhat significant person for us among that great cloud of witnesses we call the Saints of God. 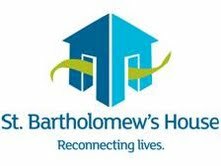 As Anglican’s we already have the name of St Bartholomew in our mind because of the wonderful Anglican Agency in our city, St Bartholomew’s House that began as a doss house for derelict and homeless men and has become one of our leading agencies addressing the enormous issue of homelessness. But, who you may ask is Bartholomew, and why did we read a Gospel story about Nathanael on St Bartholomew’s Day. Well, any Hebrew reader would have immediately recognised that Bartholomew is not the personal or given name of anyone. That is a patronymic name or family name – it means Son of Tolomai. There is another name like that in the Gospels that you will remember – Bartimaeus meaning Son of Timaeus. 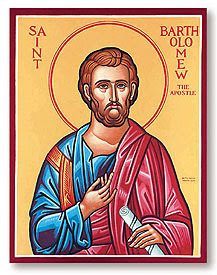 Because of this, and the fact that Bartholomew’s name in the lists of Apostles in Matthew, Mark, Luke and Acts is always placed after Philip’s name, when scholars look at this story in John’s Gospel about Philip and Nathanael they have drawn the conclusion that Nathanael is the son of Tolomai. Thus his full name is Nathanael Bartholomew. So Nathanael Bartholomew was one of the 12 Apostles – those Super Disciples who became the leaders of the early church as it spread out across the Mediterranean and other parts of the known world. This story of him in John and his presence in the four lists of Disciples mention is all we know of him from the Bible, but that does not mean we know nothing else about him. There are stories of him in other sources and from these and the accumulated tradition of the church about this saint we could paint a very detailed picture of his exploits as an Apostle and missionary. Some of them are reasonably historical but much of it is what we might call these days legendary. But that’s not a problem – we generally think very highly of someone we describe as a legend. There are stories that connect Nathanael Bartholomew with missionary work in various towns around the Eastern Mediterranean – Egypt, Turkey and more. In the fourth century, Eusebius found a story about a Missionary named Pantaenus who was evangelising in India in the area around Mumbai. He was there near the end of the 2nd century and the people there told him that Nathanael Bartholomew had already been there years before to share the Gospel. The later stories of his life, centre on the area we call Armenia – around the Caspian Sea. This is where he did his greatest missionary work and even persuaded the King of Armenia to become a follower of Jesus. This infuriated one of the Kings relatives and eventually Nathanael Bartholomew lost his head. It certainly seems to be the case that most of the Apostles embarked on missionary journeys, not just Paul and his companions. It was through this work that Christianity spread quite rapidly through what we call the Ancient Near East, and these early Christian missionaries did a wonderful and very important work. But what about you and me? Maybe some of you wanted to be missionaries but circumstances intervened. Maybe some of you want to become missionaries yourselves and go to faraway places and evangelise the people there. The reality for most of us is that if we are ever to be missionaries it will be here within our own communities in the suburbs of Perth. And one good thing about that is that you are not likely to get your head chopped off for doing it. I like this idea and I offer it you for your consideration – and perhaps your inspiration. Gossiping is something that most people engage in at some time or another. Sometimes we lay fairly negative connotations on it. Other times it is just part of the fun of our social interaction within our community. There are usually two elements to gossip that makes it work. Firstly, what we are telling someone is either secret or something we think they don’t know. Secondly, we think that they will really want to know what we are telling them. You and I love what we get from our relationship with God and this community. That is what keeps us going in our faith. One of the greatest single problems in our society is social isolation – our Nuba people can’t understand that. Our community, the place where we nurture our faith, offers a place to belong, the companionship of like-minded people (and others) who share one very important thing – we are all discovering each day something new about the Way of Jesus which we have decided to make the purpose of our lives. Talking about this doesn’t involve theological education and understanding doctrine or dogma. If you are passionate about your walk with Jesus, talking about it should be the easiest thing to do, and it should be the easiest thing for someone else to listen to. The only thing else for you to think about is “Who am I going to gossip to?” Do you belong to a group that meets each week somewhere – not this church? Sometimes you could gossip to them. Sometimes do you meet with your friends from work or your former work life for a coffee or to play golf? You could gossip to them. I think the possibilities are endless. I hope you do, too.